As one of Vancouver’s oldest settlements, Chinatown was established even before the lower mainland population was incorporated into the city we know and love. Now, as Canada’s largest Chinatown to date (the third largest in North America), this colourful neighbourhood is a prime example of Vancouver’s rich cultural heritage. While it has been the center of Chinese culture in Vancouver for more than a century, it is only incidentally a tourist attraction. It doesn’t dress up for visitors, and this is part of its charm. You’ll find things here you’ll have a hard time finding anyplace else in Vancouver. The easiest way to get to Chinatown from downtown is to go east on Pender Street to Carrall Street and find parking on the street. You can also park in the International Village Parkade at the corner of Pender and Abbott and walk east on Pender and into Chinatown. The stunning, dragon covered Vancouver’s Millennium Gate at Taylor and Pender Street welcomes visitors to a flurry of Cantonese shops dotted with scarlet red awnings, the air ripe with the scent of spice and sour fish. Countless stores are lined with jars of herbs and bins full of natural ingredients that can be mixed into healing, calming, and revitalizing brews. One can also find a number of Chinese language book and stationery stores that sell Chinese books, magazines, greeting cards, writing supplies and calendars as well as primers for learning either English or Chinese. 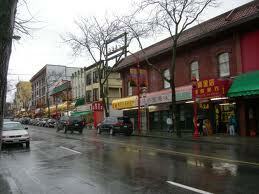 Chinatown is divided into a market section and a merchandise section. The market section runs between Main Street and Gore Street and includes East Pender, Keefer, and East Georgia streets. The merchandise section runs from Columbia to Main and includes East Pender and Keefer streets. A variety of food items, both exotic and familiar, can be purchased around the neighbourhood. It is not unusual to spot Chinese delicacies, like pig snouts, on display at local butcher shops. From street side markets to family-run restaurants, a visit to Chinatown ensures a culinary experience like no other. The neighbourhood’s Fresh Market is located East of Main St. from Gore to Hastings. Here one can find an array of items, from sharkskin to dried scallops, to fresh produce, meats, herbs, and traditional Chinese medicine. Make time to explore the Chinatown Open-air Night Market, beginning in mid-May and running through the summer. Floata Seafood Restaurant is an authentic Hong Kong restaurant offering Dim Sum, exquisite Cantonese cuisine, exotic seafood specialties and juicy Peking Duck. (400-180 Keefer Street; 604-602-0368). In Chinatown, countless shops sell an array of imported goods at bargain prices, from silk, woven baskets, rugs, teapots and authentic Chinese art, to fashion accessories, Hello Kitty calendars, and electronics. The best and easiest way to find what one is looking for is to explore the options on foot. Dragons Martial Arts Supplies carries sticks, swords and clothing for different martial arts forms along with an anomalous assortment of other things (28 East Pender Street; 604-685-2187). Tinland Cookware (260 East Pender Street; Vancouver, 604-608-0787) and Ming Wo (23 East Pender Street; 604-683.7268) sell an assortment of items for the restaurant or kitchen, including espresso machines, Dim Sum steamers, cutlery, glass and porcelain dishware, a range of house ware, and food equipment. Other places to check out in the area include the Dr. Sun Yat-Sen Classical Garden & Park (578 Carral St; Vancouver, 604-662-3207) and Chinese Cultural Centre Museum & Archives (555 Columbia Street; 604-658-8850). The Cultural Centre is a great place to find maps of the area.